David's 2016 tour concludes with a return to this historic venue, one year after his last visit, and this is the second of four shows. Could he be intending to film one or more of these new shows for future release? We certainly hope so! Tickets go on sale on Friday, December 4th at 10am UK time, and the DavidGilmourblog.co.uk presale started Wednesday, December 2nd for those who are regular contributors there. For the main sale of tickets, you can use these links: Ticketmaster, Eventim, Seetickets, Stargreen and RoyalAlbertHall.com although please be aware that demand will be incredibly high so you might need to be patient and keep retrying. Tickets are subject to fees and conditions, and are limited to four per person, across all the nights (so, you can buy one for each show, or two pairs of tickets for different shows, and so on). 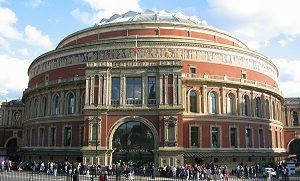 The organisers have pointed out that "for the London concerts, as with the 2015 shows, the name of the lead booker will be printed on each ticket. 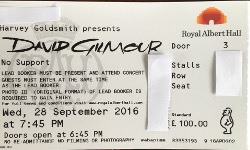 The lead booker must attend the concert and photo ID will be required to gain entry to the venue. There will be no exceptions to this rule. This is to try and stop secondary selling by ticket touts at high prices." This is exactly what happened with the Kate Bush concerts in London in 2014, and it seemed to work really well. It ensured that fans were there, and ticket touts/scalpers didn't get much of an opportunity to make a killing buying tickets for a show they would have no intention of seeing! We also understand that there will be a limited number of VIP packages available for this venue. Again, this is subject to fees and conditions. Our thanks to Gary Ashton for the ticket scan to the right. FIRST HALF: 5am, Rattle That Lock, Faces Of Stone, What Do You Want From Me, The Blue, The Great Gig In The Sky, A Boat Lies Waiting, Wish You Were Here, Money, In Any Tongue, High Hopes. SECOND HALF: One Of These Days, Shine On You Crazy Diamond, Fat Old Sun, Coming Back To Life, On An Island, Us And Them, Today, Sorrow, Run Like Hell ENCORE: Time / Breathe (reprise), Comfortably Numb. Night three at the Royal Albert Hall - the middle show of five taking place this month to close the Rattle That Lock Euro tour, and another packed hall. Tonight was to offer its own little surprise to those attending, over and above the normal set list and staging, but more about that shortly. 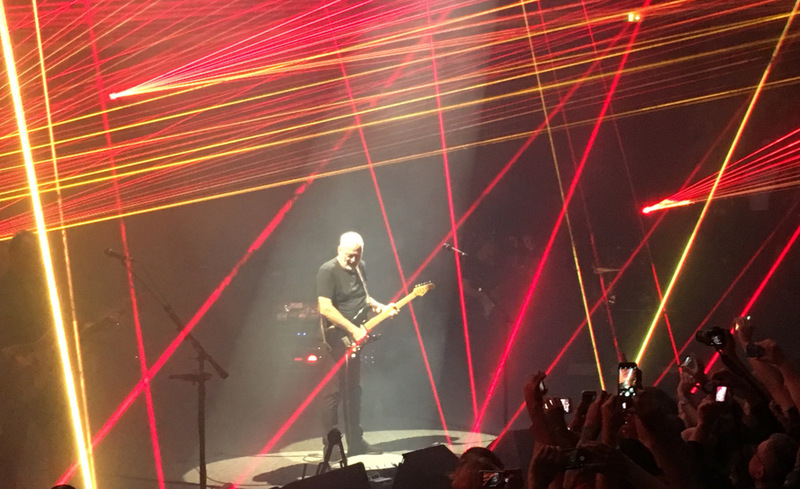 Performance wise, the show offered even more than the preceding two shows (held last Friday, and Sunday) and the band seem to be playing better in each show. Hard to believe, as the performances are exemplary, but those of us fortunate enough to have been to one or both of the previous shows have been buzzing about the musicianship on display. The set list was unchanged from Sunday, so again, The Girl With The Yellow Dress had moved aside for Us And Them. 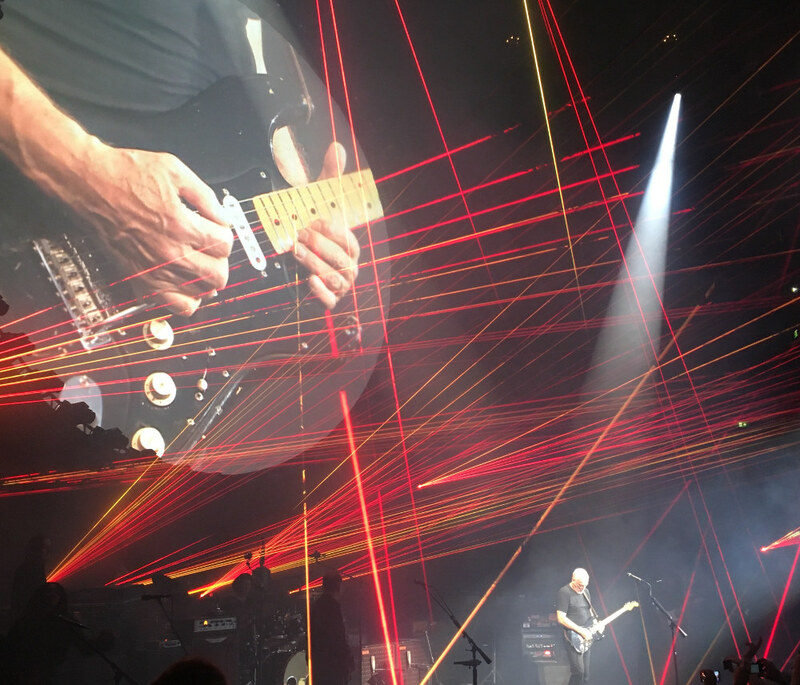 Curiously, the audience seemed pretty subdued for the first half of the show, although the wind machine and thunk of Guy's opening bass note to start the second half with One Of These Days, seemed to be the jolt that many of the audience needed to get them energised for the show. From that point on, the reactions were extremely enthusiastic - not that they weren't in places during the first half, to be fair. Faces of Stone, The Blue, Money and In Any Tongue all seemed to be particularly well received. The second set's focus on older tracks is a real crowd pleaser, although the current performances of the title track of On An Island has been thrilling audiences with the incredible guitar work and interplay between Chester Kamen (superb throughout) and David. Today, from Rattle That Lock, has also grown into a concert favourite. Those in the right position, and quite eagle-eyed, might have spotted a familiar face lurking in the wings stage right as Time/Breathe (reprise) began. Thespian Benedict Cumberbatch is not so well known for his singing (although he did sing in a 2013 production) but he very ably took on the role of the Doctor in the finale, Comfortably Numb. There was a healthy degree of shock and surprise to see the star of Sherlock, and one of the Star Trek films (amongst many other things) on stage for this song, and he seemed to have a whale of a time performing it. Pictures of his appearance will be on here shortly! Another wonderful night, and just two shows to go before the tour concludes. Will there be any more surprises to come? The shows are so good, I don't think there will be many disappointed people if there aren't! As ever, we'd love to know in more detail how the concert went from other people's perspectives. So, did you go? Let us know what YOU thought! For David's third show in this final run of five, I was fortunate enough to be offered a front row seat (thanks Nick) just two days before the show which I grasped with both hands. I already had a ticket in the sixth row but I thought front row would provide a whole new perspective and it truly did. From my seat I could really appreciate the concentration, the happiness and the shear joy expressed by the musicians on stage, particularly David as he pulled distorted faces during his solos or smiled and nodded approvingly at his band members as they received a round of applause following a tricky solo. The camaraderie on stage is palpable. I was sat between David and Chester and, being so close, I was able to hear far more clearly the sound of their individual guitars directly from their stage amps which was simply a superb experience, almost as though I was in a private studio with them. It also reinforced my belief that Chester is by far the best guitarist I've heard David play with, his accompanying rhythm, finger picking and soloing is more than just complimentary it is almost like having another David on stage, such is the quality of his playing. Again, Money and OAI were fantastic examples of this playing partnership which I cannot get enough of. Chester is also very clearly having the time of his life up there on stage with one of the best bands currently on tour, the smiles beaming from his face, the unabashedly joyful 'dancing' around is a joy to watch. David is on fire at the moment, the best playing I've ever seen or heard from him, making every note sound like it was his first ever, every solo so full of passion and invention. So many songs now are getting longer and longer as inspiration takes hold and he takes the music down fresh new avenues. Wonderful. Of course, everyone knows by now that we had a special guest vocalist during Comfy tonight in the shape of none other than Benedict Cumberbatch, playing the part of the Doctor which is quite apt as his new upcoming film role is that of Dr Strange, ironically, an old Floyd fascination from many, many years ago. You could see he was slightly nervous, who wouldn't be?, and he did fluff his lines a bit but nobody cared, it was great fun to see him up on stage and so amusing to see David's face beaming when the audience suddenly realised who'd joined the band on stage. So another fantastic show that really does get better and better with each passing performance. Next up, night four! David's 3rd show in this run and my first since the RAH shows in 2015. The show has been enhanced by a few things, firstly the use of band images on the screen, it makes a massive difference to the total viewing experience, secondly the sound, it is so crystal clear and last but by no means least, the changes in the band, both Chester Kamen and Greg Phillinganes are top quality ' no frills' musicians but they have helped added a more 'rawer' edge to the overall band performance for the better. Dare I say that the extra gigging this summer has even made a huge difference to David's overall performance, he was simply astounding. Set highlights tonight were Money, In Any Tongue, The Great Gig In The Sky, sung amazingly well by the backing vocalist's and One Of These Days...., just fantastic. Benedict Cumberbatch as the Doctor ? , well he left me a bit numb (!) but he clearly enjoyed it despite fluffing his lines and his appearance was big news. Another fantastic show at what has become my favourite venue. YOUR HELP NEEDED! 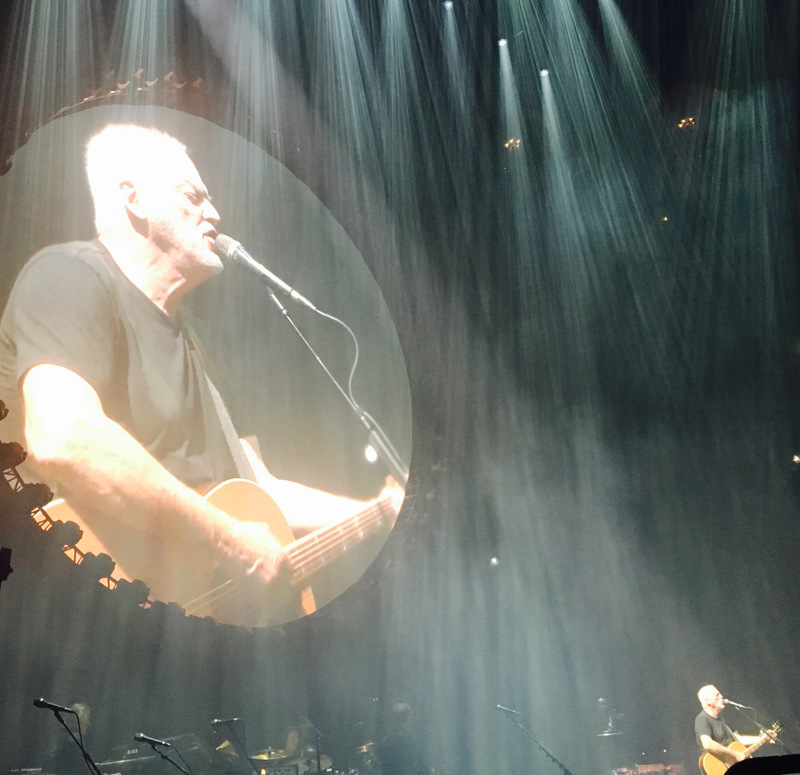 We want to cover David's concerts the best we can, to share the experience with everyone, especially those who won't be able to attend the shows. We'd love to see ANY pictures, tickets scans, reviews, newspaper reports, and anything else you come across for this show - we look forward to hearing from you!